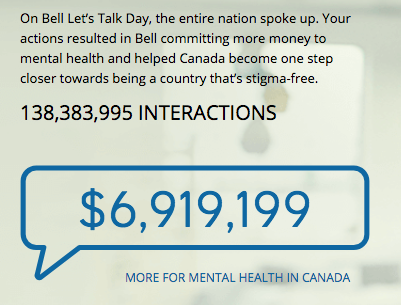 Yesterday was the annual Bell Let’s Talk Day fundraiser, which saw the company donate money towards mental health initiatives, at the rate of 5 cents for every phone call, text, long distance call or social interaction. Today, Bell announced it saw engagement levels of 138,383,995 worldwide, a 5% increase compared to 2017. The result? Bell says it will donate $6,919,199.75 to mental health programs, bringing the total Bell Let’s Talk commitment to $93,423,628.80 to date. “On behalf of everyone on the Bell Let’s Talk team, thank you Canada for showing the way in taking mental health forward – like never before! The growing engagement by Canadians in Bell Let’s Talk Day shows that together we’re changing attitudes and truly reducing the stigma around mental illness. It’s the key to making progress in a critical national health concern,” said Mary Deacon, Chair of Bell Let’s Talk, in a press release. Bell says social media engagements again led the way, with total interactions hitting 24,302,727, a 10% jump compared to last year. The company says #BellLetsTalk is Canada’s most-used hashtag and was a top Twitter trend worldwide yesterday.